One of the CDC's polite press guys, David Daigle, whom I've had the pleasure of speaking with on several occasions, posted this how-to manual to prepare for the Zombie Apocalypse, on the CDC's Public Health Matters Blog. 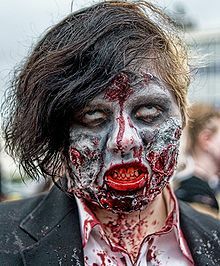 Curiously, what causes folks to transmogrify into zombies appears to be, according to Daigle, an infectious agent passed in a bite or bodily fluids that causes a neurodegenerative syndrome. Does David Daigle know something we don't know? Not to mention that patients describe both being a zombie and ME/CFS as "a living death," "death warmed up" and "I feel like such a zombie!" Below, in purple, is an excerpt from Daigle's post, which drew a whopping 23,000 readers to the lonely CDC blog--a record--causing the site to crash. A couple dressed as zombies - Danny Zucco and Sandy Olsson from the movie Grease walking in the annual Toronto Zombie Walk. I am so glad the CDC has its priorities straight. God knows being sure people are prepared for the ZOMBIE APOCALYPSE is more important than those of us who are sick and dying from M.E. (Myalgic Encepahlomyelitis). After all, we were just active and productive citizens adding our contributions to our nation and the world until we were struck down by this horrible disease. What are death and disease compared with BEING FUNNY? If these CDC press guys such as David Daigle have time to talk about the dangers of zombies, one would think they would be able to help pursue the CDC's defined goal of preventing the spread of disease, such as Myalgic Encephalomyeltitis. Hmmmmm...makes me wonder if a zombie themed protest or flashmob might get a bit of attention. I bet the austism parents aren't happy about this either. Yes, but is it Section 508 Compliant? You know that is why the CDC can't change a thing, it is so hard, Soooo Hard to be Section 508 Compliant! @ David: Not if the Zombies are sporting "Silence=Living Death" stuff and passing out educational literature. the 'joke' would get public attention and perhaps lure a few well people in to take part? Hmmm, maybe we should bite David Daigle. I applaud the use of humor on an otherwise serious site to make a point. Sadly, in the event of a real zombie apocalypse, the CDC would declare mass hysteria and go home. At least people with the illness are fully aware that something is horribly wrong. The rest of society appears to be completely oblivious that something is seriously amiss. Perhaps it is those who don't have any outward signs of ME/CFS who truly have the purest form of a brain-destroying apocalyptic disease. You guys complaining about this need to lighten up. All this really is showing is how to put together a decent survival kit for ANY emergency, not just zombies. If putting zombies in the title gets more people aware as to how to survive in a disaster then good for them for being creative enough to get it out. Don't be so judgmental just because they aren't doing it exactly the way you think it should. I love this post by the CDC. "Perhaps it is those who don't have any outward signs of ME/CFS who truly have the purest form of a brain-destroying apocalyptic disease." i don't understand what you're trying to say here. perhaps the pure form is just a carrier waiting to erupt. Any apocalypse survival guide that's worth its salt will cover zombies. Everyone knows Z day is on the way its just a matter of time!